The SMB protocol provides the possibility to set the last write time by the client. But unfortunately, the time must be provided in local server time. But how could the client possibly know the local server time? While establishing an SMB connection, the local server time and time zone is provided by the server. Windows CE 5.0 seems to determine the time difference between the server time zone and its own time zone on opening the connection. When writing to a file on the SMB share and closing it, the time difference appears to be used to calculate the server local time based on the client local time. But if the time zone is changed either on the client or on the server while the connection exists, the calculation will result in a wrong modification timestamp because the time difference is no longer valid. As an SMB connection is automatically terminated after a specific time (10 minutes by default) when all resources have been closed, the problem might not be very obvious. If the SMB connection is re-established or after a reboot, the new time difference will result in valid modification timestamps again. As you know information management is always a topic which needs a lot of attention. A problem with which the Microsoft Windows Embedded Team also has to cope with, due to the huge amount of information there is around Windows Embedded. If you have ever searched MSDN looking for Windows Embedded CE BSPs and/or drivers then you will know what I mean. Lucky enough, Microsoft now offers new windowsembedded.com vanity URLs so that you can quickly get to the search lists. do you have questions regarding Windows Mobile application development that you need answers to? So join the live chat with Microsoft employees, MVPs and experts in Windows Mobile application development and bring on the questions! This chat will cover the tools and technologies used to develop applications using the Windows Mobile operating system. Here's something I just came across while preparing a post about "Inside of NavReady". "Windows SideShow for Windows CE 5.0 is a separate installed product. It must be downloaded and installed in order to be added to an existing installation of Windows CE 5.0." My workspace is perfectly prepared for CE driver development tasks. There are a number of tools, e.g. my favorite text editor, diff tool and a powerful grep. And one of the convenient things on my workspace is a good search pattern for "Find-In-Files". OK, so you have heard that the driver architecture changed from CE 5.0 to CE 6.0, but are you sure you know what to do? Wouldn't it be good to have a How to? Well in that case I've got just the link for you. On Channel 9 you can find a detailed presentation on getting your Windows CE 5.0 driver to work under CE 6.0. The presentation looks into memory management, marshalling, threading and security. If you're not aware of the differences between CE 5.0 and CE 6.0 then have a look at the article Differences between Windows CE 5.0 and Windows CE 6.0 on WindowsForDevices.com. Fortunately Microsoft offers a Platform Guidance Datasheet showing the main differences between the two platforms. 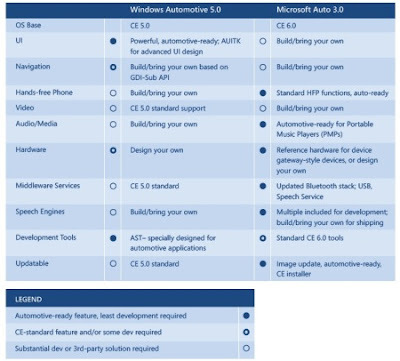 As you can see Windows Automotive 5.0 is based on Windows Embedded CE 5.0 ( same as NavReady 2009 ) and offers the same full flexibility whereas Microsoft Auto 3.0 is based on Windows Embedded CE 6.0 and provides a standard hard- and software platform enabling OEMs and Tier1s to build solutions a lot faster. Fiat's Blue&Me, by the way, which features Elektrobit's Navigation solution is based on Windows Mobile for Automotive which is the predecessor of MS Auto. you can join the live chat with the Embedded Windows product team on August 28th at 10am (PST). On August 12th, 2008 Microsoft released a Community Technology Preview (CTP) Refresh of Windows® Embedded Standard, the next generation of Microsoft® Windows® XP Embedded and this live chat will focus on these two CTPs. With download of these CTPs you have a chance to win a Microsoft Mobile Memory Mouse 8000. On August 28th you can ask the experts and give your first feedback about these releases to MS. The cause for this is very often due to a missing Windows CE Update when changing configuration, i.e. from ARMV4I to x86. So if you do come across this error check the Updates you have registered on your computer. An easy way to do this is via ceqfecheck.exe which you will find in your Windows System32 Directory, e.g. C:\WINDOWS\system32\ceqfecheck\. You can't find it? Well don't worry, this tool is not part of the standard Windows CE Installation; it is installed via any QFE. BTW: "We call it a Klassiker." is a quote from Franz Beckenbauer before the England-Germany football Worldcup qualification game on September 1, 2001 in Munich - which England won 5-1! and enter for the chance to win a Microsoft Mobile Memory Mouse 8000. The Windows Embedded Standard Team is giving away 10 of these mice to people who download the Windows Embedded Standard CTP Refresh by 29th August. The first updates for Windows Embedded NavReady are available for download (http://www.microsoft.com/downloads/details.aspx?FamilyID=10479d0c-43d2-4e31-9bc1-d813a987f830&DisplayLang=en). the latest Windows CE updates have been recently released and are available for download. Some critical issues have been resolved so get them now! More information for each update is provided in the Readme document available after the individual update(s) has been installed. 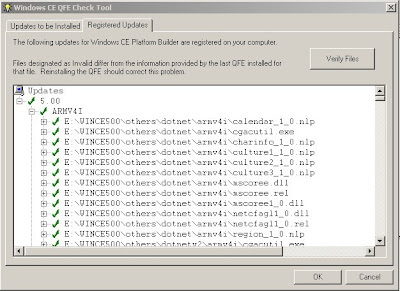 Description: This is a set of updates for Windows CE Platform Builder released during the period of July 1 - July 31, 2008. These Microsoft Windows CE updates are fixes for Windows CE operating system problems you run into during the development and maintenance of your custom platform. It contains important updates about FileSys (SD card mount failure may occur when FATFS driver checks FSInfo when mounting a store. TFAT corruption may occur if power is turned off during the NAND flash write operation) and adds support for .NET Compact Framework v3.5 to the platform builder. 080728_KB952264 - This update adds a check for NULL pointer to resolve some issues. 080718_KB955159 - When using the Soft RTC, the hardware clock can tick slightly faster than the software clock and result in unstable clock behavior. 080723_KB955698 - This update allows to limit resource calls on kernel threads only in PSL context. 080725_KB955467 - A DEBUGCHK in DEBUG KERNEL may cause a device to halt during bootup if USB hard disk attached. 080702_KB953953 - This update addresses a memory leak. and integration of SQL Compact 3.5 SP1 and .NET Compact Framework v3.5 in Platform Builder. The site also offers you the possibility to stay tuned about new and updated BSPs via rssfeed. TerreStar Corporation announced plans to launch the slimmest satelite phone yet, designed by EB. The picture on the right shows you the "EB-TerreStar reference design". The handset will offer "4G" HSPA (high speed packet access), push e-mail and your other favorite Windows Mobile features. MS has released the Windows Mobile API Usage Tool. This tool performs static analysis of applications and binaries designed to run on Windows Mobile devices and reports on the usage of system APIs and other resources. The goal of the tool is to provide a report of system dependencies to the application developer, optionally including the deprecated APIs that the application may currently depend on. It is a commandline tool, its name is wmaut.exe and the output is a SQL database file (*.sdf).